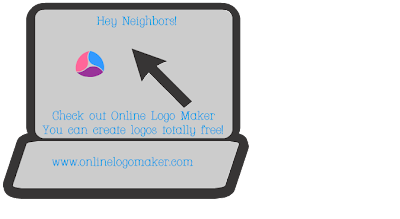 At the Fence: Online Logo Maker! I just have to share this site with you. It is called Online Logo Maker , a free logo maker to create your own logos. I am not a geek. When it comes to computers and designing I am not totally ignorant, but I do have a geek on hand when necessary. Needless to say, I did not need assistance with this one. Online Logo Maker is easy to use. I could add pictures, graphics, text and then move, layer and resize as needed. There is a short tutorial you can watch before starting, and to be honest most of it is pretty easy to figure out just by going in and playing around a little. The above logo was designed last night for announcing spring here At the Fence. I decided to try another one this morning. So I did one about the free logo maker from Online Logo Maker! What do you think? It is seriously so simple to use, and yet turns out great looking logos. This is definitely a site I will be using more often. I will be designing buttons and other logos for my site, as we plan special events and such. Is this a site some of my neighbors would use? I sure hope so. The site includes some symbols for your use and then you can upload images of your own. There are several text choices to choose from. Your create your design and use the toolbars for as you work. On the right hand side you choose what you wish to add to your design. On the left hand side you can rearrange, change layers, and remove items from your workspace. The toolbar along the bottom allows you to choose the type of text you desire, change color of the background and images, reduce or increase size, rotate, move and add shadows. There is so very much you can do with this program. I was very impressed. Be sure to visit the Online Logo Maker site and try designing something your self. If you do be sure to leave a comment here to let me know what you think, or if you use the logo leave a link to what you have done. Thanks neighbors and see you soon At the Fence! Disclosure:This is a sponsored post however all thoughts and opinions are mine!